The Timber Lodge barnwood pool table is our newest design, and is a rough sawn timber billiard table that will be the highlight of any rustic game room area. 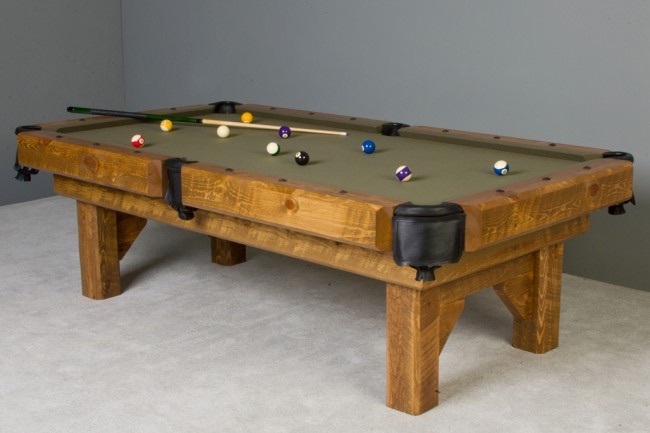 The Timber Lodge barnwood pool table is made from rough sawn pine timbers to replicate a barnwood look at an affordable price. The legs on this table are six inch by six inch solid rough sawn pine timbers. The body wrap is made from 1 and 2 inch rough sawn pine boards. The rails are constructed from six by six rough sawn pine timbers. The spotting points or sites are black 1 inch square hand forged iron clavos doornails which give this table a western or ranch feel. Every Barnwood pool table is finished with a catalyzed lacquer to protect it for years to come.